Some of my research is highlighted below. Hyperlinks take you to the journal page for my papers. Keylock, C.J. 2018. 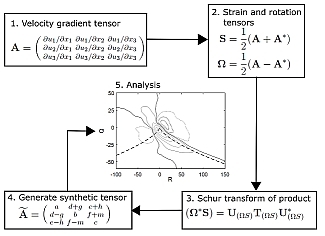 The Schur decomposition of the velocity gradient tensor for turbulent flows, Journal of Fluid Mechanics 848, 876-904. Keylock, C.J. 2017. Synthetic velocity gradient tensors and the identification of significant aspects of the structure of turbulence, Physical Review Fluids 2, 8, 084607. Higham, J., Brevis, W., Keylock, C.J. 2016. A rapid non-iterative proper orthogonal decomposition based outlier detection and correction for PIV data, Measurement Science and Technology 27, no. 125303, doi: 10.1088/0957-0233/27/12/125303. Keylock, C.J., Ganapathisubramani, B., Monty, J., Hutchins, N. and Marusic, I. 2016. The coupling between inner and outer scales in a zero pressure boundary layer evaluated using a Hölder exponent framework, Fluid Dynamics Research 48, 2, 021405. Keylock, C.J., Stresing, R. and Peinke, J. 2015. Gradual wavelet reconstruction of the velocity increments for turbulent wakes, Physics of Fluids 27, 025104. Keylock, C.J. 2018. Gradual multifractal reconstruction of time-series: Formulation of the method and an application to the coupling between stock market indices and their Hölder exponents, Physica D 368, 1-9. Higham, J.E., Brevis, W., Keylock, C.J., Safarzadeh, A. 2017. Using modal decompositions to explain the sudden expansion of the mixing layer in the wake of a groyne in a shallow flow, Advances in Water Resources 107, 451-459. Keylock, C.J., Chang, K.S., Constantinescu, G.S. 2016. Large eddy simulation of the velocity-intermittency structure for flow over a field of symmetric dunes, Journal of Fluid Mechanics 805, 656-685. Keylock, C.J. 2015. Flow resistance in natural, turbulent channel flows: The need for a fluvial fluid mechanics, Water Resources Research 51, doi: 10.1002/2015WR016989. Keylock, C.J., Lane, S.N., Richards, K.S. 2014. Quadrant/octant sequencing and the role of coherent structures in bed load sediment entrainment, Journal of Geophysical Research 119, 264-286, doi: 10.1002/2012JF002698. Keylock, C.J., Singh, A., Foufoula-Georgiou, E. 2014. The complexity of gravel-bed river topography examined with gradual wavelet reconstruction, Journal of Geophysical Research 119, 682-700, doi: 10.1002/2013JF002999. Keylock, C.J., Singh, A., Foufoula-Georgiou, E. 2013. The influence of bedforms on the velocity-intermittency structure of turbulent flow over a gravel bed, Geophysical Research Letters 40, 1-5, doi:10.1002/grl.50337.